As the days get shorter and the leaves fall, you may be putting away your golf clubs for the season. You are probably looking forward to Thanksgiving turkey and trimmings, with holiday cookies soon to follow. But the end of summer doesn’t have to mean the end of your exercises. We’ve got plenty of things that will keep you fit for fall, and for the winter to come. Though leaf watching season is almost over, mild daytime temperatures make this a great time of year to get out for a hike or walk. Hiking is a great way to work on your fall fitness, and the bare trees offer different and unique vistas that you might not see during the spring and summer. There are some wonderful options within a few minutes of Fox Hill. Closest to us is Cabin John Regional Park, which is open from sunrise to sunset. The park features five miles of hiking and biking trails with several access points. It also sits in the middle of the nine-mile Cabin John Stream Valley Trail. The trail is just a few minutes from the heart of Bethesda and major interstates, but you’ll find yourself deep in the woods. The C&O Canal spent yearly 100 years as a lifeline for communities – like Bethesda – along the Potomac River. The National Park Service maintains the canal and its surrounding paths. You will enjoy great hiking or biking, and wonderful views, too. Want a hike with a view? Head to Great Falls, where the Potomac River cascades through a series of steep, jagged rocks while flowing through the Mather Gorge. Great Falls is also the spot where George Washington founded the Patowmack Canal Company. Fox Hill’s location combines easy access to beautiful outdoor spots with the best of city living. Swimming isn’t just a summer sport at Fox Hill. 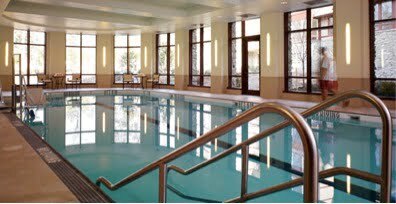 Our indoor exercise pool is available for use year round, making it the perfect place for fall workouts. Pool exercises are a great way to stay in shape if you suffer from arthritis, strained ligaments or other medical conditions that can cause regular exercise to do more harm than good. Water workouts put less stress on your joints, whether you’re swimming laps or performing water aerobics. Swimming can burn up to 500 calories per hour, making it a great wintertime replacement for cardiovascular exercises such as walking or hiking. And don’t forget, after you’ve worked your muscles in the pool, you’ll have more than earned a relaxing afternoon in our Sanctuary Spa. Chest and back stretch: In a seated position, extend your arms in front of you at shoulder height. Interlace your fingers or grasp one hand with the other and press out as you round your upper back and shoulders forward. Hold for 10 seconds and release. Then extend your arms straight down behind you and interlace the fingers, keeping your hands by your lower back. Repeat each stretch several times. Elbow to knee: Seated toward the edge of your chair, start with right arm extended overheard. Lift the left knee as you lower your right elbow. Try not to bend at the waist. Return to starting position and repeat 8 to 10 times. Then switch sides, pulling left elbow to right knee for 8 to 10 repetitions. Do a second set of each, if you’re able. Part of staying fit as you age is staying active. That can mean more than the traditional exercise options we’ve outlined. Do you enjoy woodworking? Take advantage of our shop to work on a project. Perhaps you’re looking to build Christmas presents for the grandkids, or to teach them some of the skills you learned at their age. Perhaps you’ve never thought of your time in the woodworking shop as “exercise,” but you’re on your feet and moving around. That burns calories and builds muscles. The same theory is true in our greenhouse. Cultivating some fall and winter plants is a great way to get up and move around for a few hours. Why does fall fitness matter? There are of course the obvious benefits of exercise, such as controlling your weight, cholesterol and blood pressure. But exercise does far more than let you enjoy dessert with a clean conscience. As the Harvard Health Letter noted last year, exercise reduces insulin resistance and releases chemicals that reduce inflammation in your muscles and joints. Exercise is proven to reduce stress and anxiety; it also helps people sleep better. Finally, exercising the body is great for your brain. A 2014 study by the University of British Columbia found that aerobic exercise – i.e. getting your heart and sweat glands pumping – boosts the size of the hippocampus, which is the part of the brain that manages verbal memory and learning. If you have health issues that prevent aerobic exercise, you can get most of the same benefits from resistance training, balance and muscle-toning exercises. The study also discovered that two hours a week of moderate exercise appeared to make the prefrontal and medial temporal cortexes of the brain bigger. Those parts of the brain control thinking and memory. In short, a 30-minute walk after breakfast four days a week will make you better at completing the crossword.